The discourse on French colonialism focuses largely on economic and political policy. However, little emphasis has been placed on the day to day reality of colonial living, particularly the ever-changing environs influenced by these policies. 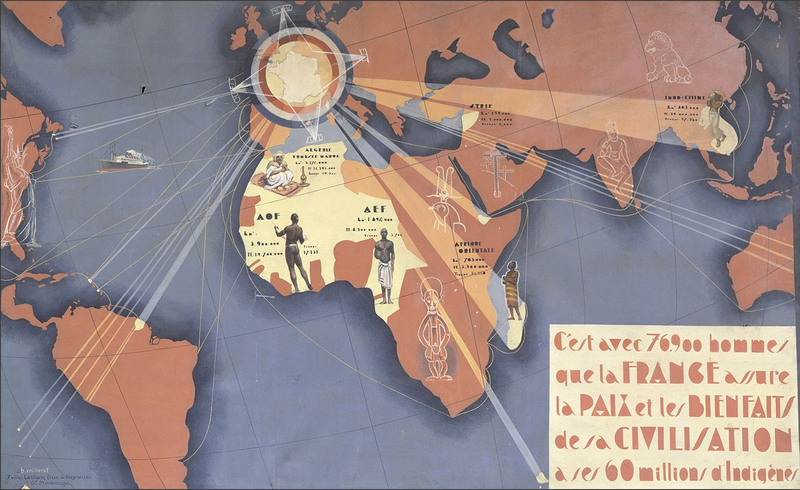 Similarly, within the last forty years, French Art Deco design, which was greatly inspired by the colonies, has become a popular area off research among Art Historians, beginning with the 1971 Minneapolis Institute of Arts exhibition World of Art Deco: An Exhibition, and most recently the Metropolitan Museum of Art’s publication French Art Deco. However, little research has been conducted on how the contemporaneous policies and designs influenced one another- ultimately affecting the quotidian of French colonial life. Scholars such as Jean-Louis Cohen and Gwendolyn Wright have begun to explore this area with their extensive work of French colonial architecture, but my interest lies within the walls. The following is an example of the rich interiors and innovation designs that have yet to be fully recognized and analyzed. It is unknown whether or not this interior was implemented in the region for which it was designed. However, its presence at the exhibition reflects the the practical issues of colonial living that French Art Deco designers were attempting to address. “partie de petite habitation moderne conçue et aménagée pour la vie coloniale… outre la forme, neuve et décorativement séduisante… d’un transport facile et sans aléas et d’un encombrement minimum. Avantage à considérer, pour des coloniaux qui sont appelés à se déplacer souvent.” Pierhal, “L’Art Décoratif à l’Exposition Coloniale,” 411.